"Pain" tells the love story between a man who can't feel pain and a woman sensitive to pain due to having hemophilia. 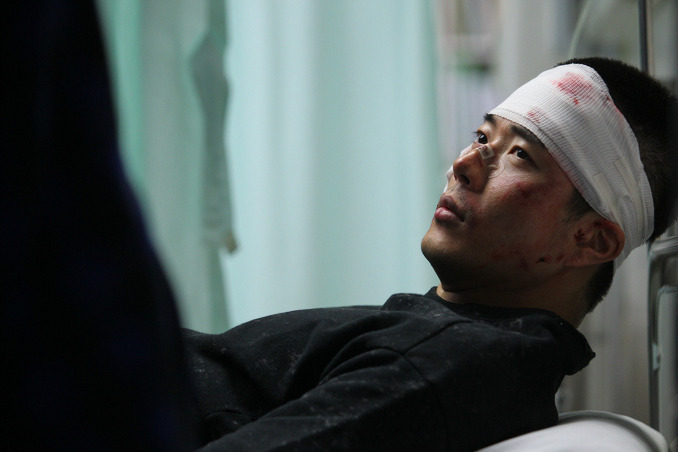 Nam-Soon (Kwon Sang-Woo) works as a money collector for a loan shark. His role is to act as a human punching bag, shocking clients into paying their debts. Nam-Soon lost the ability to feel pain a long time ago. His family was involved in a car accident and Nam-Soon was the only survivor of that accident. The guilt from causing the distraction that took place immediately before the accident and then not being able to pull his family out from the burning car has led to his inability to sense pain. Nam-Soon also lost the will to live after the accident. 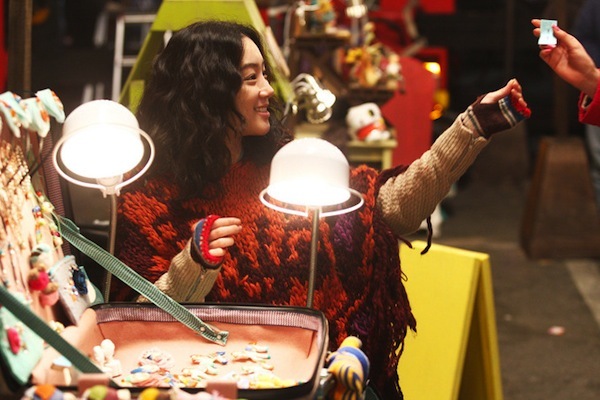 Dong-Hyun (Jung Ryeo-Won) also lost her parents at a young age. Both of her parents died from illnesses. She was left all alone in the world & burdened with the debts of her parent's massive hospital bills. Making matters worse for Dong-Hyun, she suffers from hemophilia. She supports herself by selling handmade items out of suitcase. 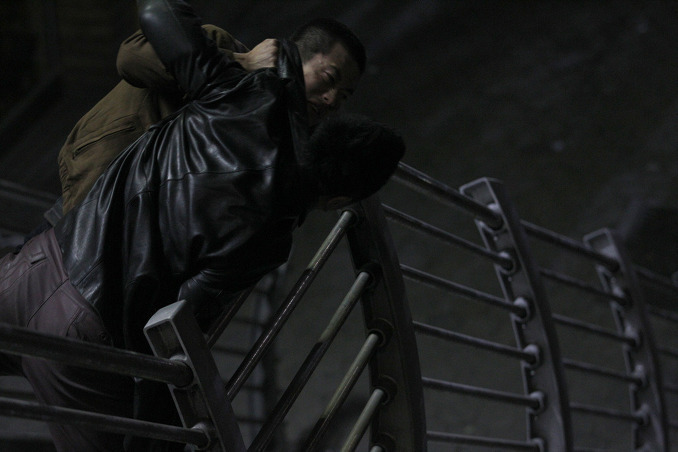 One afternoon, Nam-Soon and Bum-No (Ma Dong-Seok) go to Dong-Hyun's home to collect on a debt owed to loan sharks. Dong-Hyun doesn't answer the door and waits until she is sure the men have gone, before leaving for work. She's startled to find Nam-Soon waiting for her. Dong-Hyun tells Nam-Soon that she doesn't have any money for him. Nam-Soon proceeds to start breaking things and also hurting himself, while making a loud racket. Police soon arrive and Nam-Soon takes off. Nam-Soon is not out of Dong-Hyun's life and in fact she can't get away from him. Dong-Hyun learns that her landlord paid Nam-Soon her apartment's deposit money after Dong-Hyun made a loud bloody racket in front her. Dong-Hyun now has no place to sleep. She then starts to spend nights her nights in 24 hour saunas. Then one evening in the subway as Dong-Hyun stores stuff in a coin operated locker a group of homeless men approaches her. Her father owed money to one of the now homeless men. A scuffle occurs and Dong-Hyun passes out. The homeless men carry Dong-Hyun into a van. Nam-Soon watching from a distance comes to Dong-Hyun's aid. 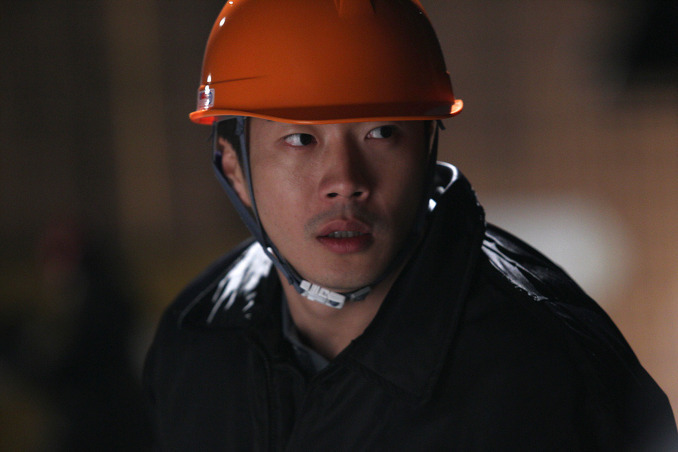 Nam-Soon takes Dong-Hyun back to his apartment and lets her stay there indefinitely. Filming began on February 10, 2011. "Pain" was originally planned to be written as a comic by comic artist/screenwriter Pool Kang in 2006, but by 2009, Pool Kang decided to write the original scenario into a feature length screenplay. crazykdramaaddinct Jul 09 2017 9:35 am How she did not die when they slept together?!? She was virgin, wasn't she? SadMoviesAreLife Jun 27 2017 8:37 pm Kwon Sang Woo makes this movie, he keeps you watching. Jung Ryeo Won was good too but KSW is the one you will feel the most sympathy for. Han Sep 04 2012 8:33 pm Can anyone please tell me the song that is played in the international trailer? Thank you so much! pegupayo Aug 09 2012 1:36 am Done watching this movie and I loved it﻿ eventhough its tragic, can anyone tell me what’s the title/artist of the english soundtrack played around 0:34:41 of the video.. I want it so badly but I’m having a hard time looking for it in the internet, so please please help me. Thank you!! iimman Jan 17 2012 12:26 pm Woman with a hemophilia is a rare case, most of it just a carrier. But that doesnt mean that woman could not have it. mimi Nov 15 2011 3:46 pm hi i love this movie please tell me a song in this movie lyrics "sleep when you get angry. smile when you get trouble. how about a coffee or cup of tea"
I know very little about hemophilia, but just from reading your comment I would like to point out a fatal flaw in your argument. You use two propositions to point out that young girls with hemophilia "usually die" and have a "huge possibility of bleeding to death" when they reach puberty. Assuming you are 100% correct that young girls with hemophilia "Usually die" and have a "huge possibility of bleeding to death" when they reach puberty - those two statements still clearly proves that at least some young girls with hemophilia are able to survive past puberty. So going from your propositions, it certainly seems plausible for the movie to feature an adult female character living with hemophilia. Or put in another way, if a movie featured a story about the survivors of a plane crash and, in reality, it's probable that most people die from plane crashes ... would you chastise the filmmakers for making a story on the survivors? Ki Sep 17 2011 12:37 pm Watched "Pained" on it's opening day here in South Korea. Prior to going in I was excited to watch the film, but with some reservations. 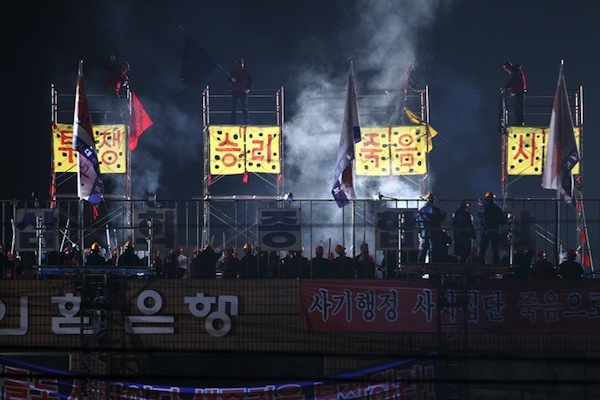 Reservations = I'm not a big fan director Kwak Kyung-Taek's past films. Usually, he's just way too sentimental and attempts to tug on your emotions with all the subtlety of a jackhammer. 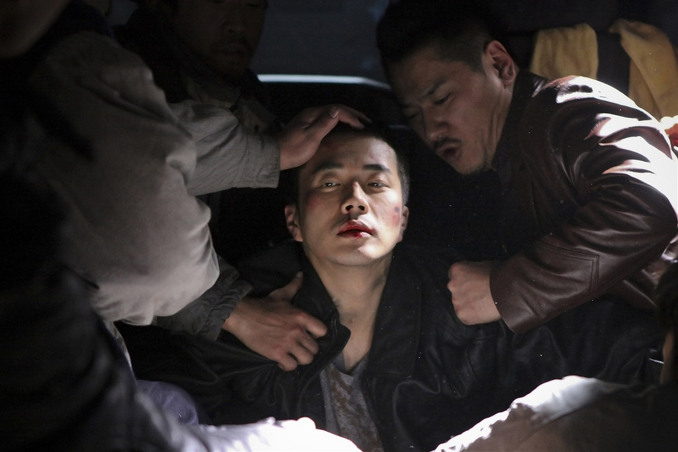 Same goes with a lot of main actor Kwon Sang-Woo's films. Excitement = Really enjoyed Jung Ryeo-Won in "Castaway on the Moon" and the way underrated film "Two Faces of My Girlfriend". Also the screenplay for the movie seemed really fresh and the trailer looked promising. Anyways must say at least the first half of "Pained" was really good. Surprisingly, I found myself really impressed with Kwon Sang-Woo's performance and thought this was his best performance to date. Movie looked great and the enticing premise of a man who can't feel pain (due to a traumatic childhood incident) and the woman suffering from hemophilia really piqued my interests. As the story progresses I really felt for the main characters, though (another surprise) I was less than impressed with Jung Ryeo-Won. Her character's personality and physical appearance (wardrobe etc.) recalled too much of her character from "Castaway on the Moon," enough so that most of the time I saw her on the screen I kept thinking of that other movie. After the two main characters move in together I thought the movie hit its high point. Again, really impressed with Kwong Sang-Woo. The way his character wanted to hide all feelings for his roommate, but those feelings still came through was compelling. Around this time I did have thoughts on how the movie would resolve itself and what type of dilemmas the movie would conjure up leading up its finale. Unfortunately, the movie went downhill from there and the ending screamed out all of the hallmarks of Kwak Kyung-Taek's past films = the dire need to elicit tears from the audience. I didn't go for it and thought it was unwarranted. In the best of all possible worlds, I would have loved to see the movie focus on the couple's attempts to live together as a couple and their daily troubles. The movie rather opted for a way heavier (and cliched) tactic for its finale. You can say the ending was a thud for me both literally and figuratively. 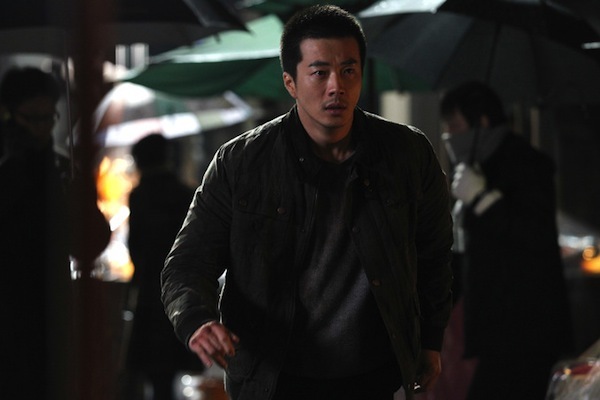 With that said I don't want to seem too negative on the film as I really enjoyed most of the film and thought Kwon Sang-Woo gave the performance of his career. I would even go so far as to say this is one of the better commercial Korean films for this year. Not as strong as "Sunny" or "War of the Arrows," but up there in likeability and uniqueness. Only problems I had was the corny ending and the feeling of having seen Jung Ryeo-Won's performance already in "Castaway on the Moon." Even with those two complaints, I still think "Pained" is a film to check out. Lala Sep 16 2011 7:51 am She has hemophilia...??? All I know is that girls with hemophilia usually die when they reach puberty because a huge possibilty of bleeding to death during their monthly period -_- unless she`s actually only a carrier of the disorder. Does the writer know what hemophilia really means? 602578 Aug 05 2011 3:03 pm So he doesn;t feel pain, but later on the story, he is going to feel pain when he falls in love with her!!?? Hmm, love Jung ryeo won and Kwon Sang Woo soo much! Cannot wait till this movie comes out.